We don’t just design houses. We design homes for families to live out their memories. Help us create beautiful, well-engineered spaces where the lives of homeowners will unfold! New home design plays an important role in whether homebuyers can see themselves living in a home. Our in-house architecture team takes pride in designing functional living spaces. Many subtle features are only discovered and appreciated after life in the home begins. Architecture partners with interior designers, as well as nationally recognized outside architects to create homes that maximize space and livability for homeowners. Merchandising designs the interiors of each model home so potential buyers can envision a life in that home. Furniture, fabrics, art, accessories, cabinets, lighting, flooring and finishes are all selected and coordinated to create a look that inspires homebuyers and compliments the home’s floor plan. This team reviews and selects quality product lines for the Home Gallery™ design center. It’s also Merchandising's job to collaborate with architecture to design livable floor plans that work for a variety of lifestyles. Even the exterior color palettes and sales center designs are handled by this team! 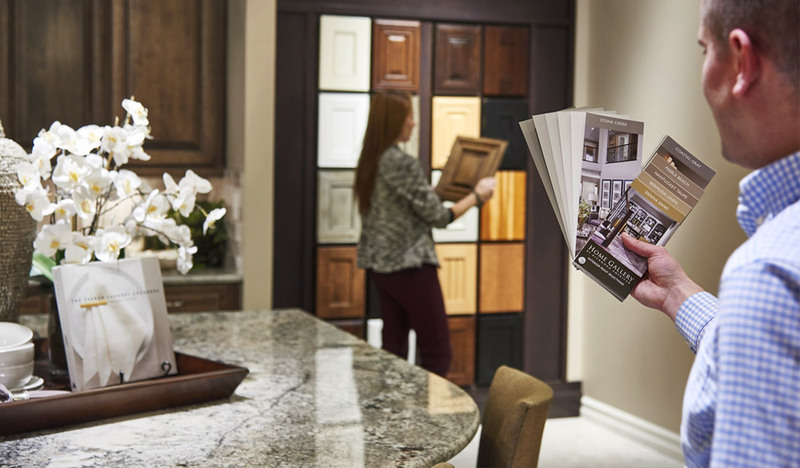 Once someone decides on a floor plan, it’s time to make an appointment at the Home Gallery™ to select fixtures and finishes. Our design consultants walk homebuyers through the process of choosing everything from cabinetry to fixtures to create a look that matches their taste and budget.